"It's always been just Kate and her mom--and now her mother is dying. Her last wish? To move back to her childhood home. So Kate's going to start at a new school with no friends, no other family and the fear her mother won't live past the fall. Then she meets Henry. Dark. Tortured. And mesmerizing. He claims to be Hades, god of the Underworld--and if she accepts his bargain, he'll keep her mother alive while Kate tries to pass seven tests. Kate is sure he's crazy--until she sees him bring a girl back from the dead. Now saving her mother seems crazily possible. If she succeeds, she'll become Henry's future bride, and a goddess. 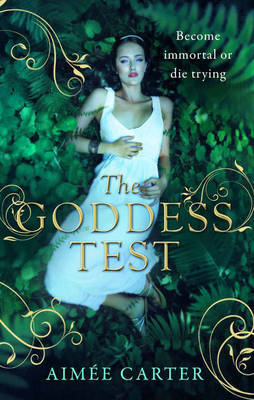 If she fails..."
The Goddess Test was one of these books that I had heard so much about from blogs around the world, but when I went to buy it I found that at the time it was only available in the USA so when I got an email regarding a blog tour for the UK release I was absolutely thrilled. So I read through the book in little less than a day and it didn’t disappoint me! Not once, the fantastic book sucked me to its depths of the pages and when the end came I was and still am desperate for Goddess Interrupted. Now one of the striking things about this book is the story line. It’s just so brilliant. The only word to use I suppose is Unique... and a load of other complimentary words. It just has such a simple, yet so different story line, and I suppose it what I needed for my Greek fix. The plot follows, Kate Winters who has moved back to Eden in the wake of her mother’s last days, only to find that she can save her by making a deal with a mysterious boy. And then... she is sucked into a magical Greek world. The plot is based on the original myth of Hades and Persephone but it has a unique, modern, and magical twist I suppose that gives it all the sparkle. The writing was brilliant as well. The first person worked well, and was good because Carter managed to work other people’s feeling into the prose as well. That’s other thing. It had a magical prose. There was no forced reading of the type because one I had started it flowed smoothly through the full way. The characters were so incredibly formed, and so definitely not what they seemed, as you find out at the end of the book and I have to admit the ending was incredibly surprising and was most definitely my favourite part of the book, filled with shock, suspense and surprise. The character were all described into so much detail that you became friends with them. Even the ones who turn out to be enemies. My favourite character would have to be Henry though, mainly because he was so incredibly awesome but when you studied him in detail he was really nice. He cared about everyone but himself, doing all he could to make others happy unless of course the deserved to go and spend time with all the people they brutally murdered. Overall though I really did Love the Goddess Test. It’s is a beautifully written book, a tale of love, and an anciently old myth sparkling with a magical twist. I really enjoyed this book. Aimee Carter's style of writing is relaxed yet descriptive enough to create a sort of dreamy and dark atmosphere. I was really hooked by the premise - it's a Greek myth turns reality sort of deal with a bit of a twist. Kate is the modern day Persephone, and Henry is Hades. The catch, however, is that there are no sinister machinations going on that Kate isn't aware of. There's no kidnapping; no imprisonment. In fact, she walks into the deal knowing fully well what's expected of her.